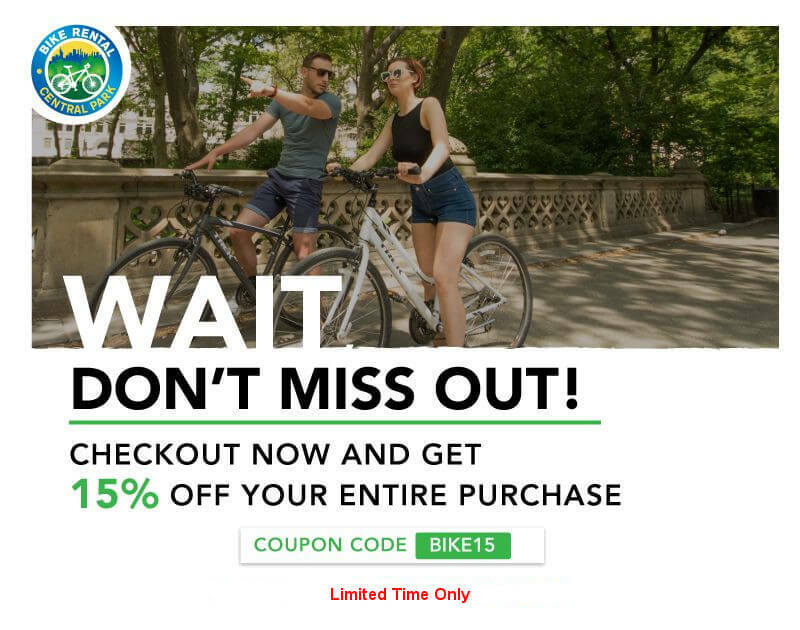 Find the Best Bike Route in Central Park for Your Sightseeing Adventure | Rent With Us Online and Save on the Best Way to See Central Park in NYC! Many would say that the best way to tour Central Park is by bike. What better way is there to enjoy nature than a nice pedal around the many attractions and beautiful sites that Central Park has to offer? It's also a good idea to rent a bike just because the park is so big: It takes up 862 acres, and if you were to travel the big loop, it's around 6.1 miles long. There's a lot to see and do here, and traveling by bike is the best way to see Central Park, NYC, within your time frame. Worried that you'll pick the "wrong" path and miss out on something great? Fear not: We've chosen a few locations that our expert tour guides consider to be the best bike routes in Central Park. Many people may consider this to be the best bike route. Central Park has a main road that circles the entire park with varied terrain and easy access to public bathrooms. This route will take you to many of the biggest attractions in the park and will cover just about six miles of cycling. This loop even has earned accolades from the Village Voice, which in 2011 rated this the best bike route. Central Park's main loop is a great workout and an essential trip for those who want to see all the sites. Want to avoid the big hill at the northern end of the Central Park bike route? Then you should definitely opt for the Lower Loop at the southern end, which will still bring you to some of the most notable locations in the park. Just remember to bike carefully, as this area can get crowded with runners and tourists. Visit one of the park's most popular entrances at 60th Street and Fifth Ave. It's lined with benches, vendors, and entertainers. This is the place to bike if you don't want to miss the action, and you can take a detour and circle around the nearby Grand Army Plaza if you want. This beautiful path runs right through the center of the park. It's lined with elm trees and beautiful at all times of year, and there's plenty of room for cycling on this wide path. Although Central Park is crowded, it can be a fun and safe place to bike as long as cyclists are aware of their surroundings and follow the basic rules of cycling the park has put in place. These rules are pretty common to most areas: Wear a helmet (included with every rental from Bike Rental Central Park), yield to pedestrians, obey signs, ride with traffic, and stay off the sidewalks and expressways. Ready to explore Central Park for yourself? We can supply you with a professionally maintained Trek bike so you can see it all. Enjoy one of our tours, or set out on your own to explore. There's no doubt that this is the best way to explore Central Park, and with rental prices starting as low as $9, you have nothing to lose!